Henrik Christensen, the director of the Contextual Robotics Institute at the Jacobs School, testified March 16 in front of the U.S.-China Economic and Security Review Commission, a bipartisan group that monitors and investigates the national security impllications of the bilateral trade and economic relationship between the United States and China. The hearing's theme was "China's pursuit of next frontier tech: computing, robotics and biotechnology." Christensen's testimony was part of a panel on military and industrial robotics. He was quoted on the topic of industrial robotics and China in a January story in The New York Times. 2/ @hiskov #Robotics is an industry tinvented and developed in the US. Today many industrial robots are made in Japan, Germany and China. 3/ @hiskov: Until 2013 US was the largest market for #industrialrobots. Today the Chinese market is 2.4 times larger than the US market. 4/ @hiskov The Chinese #robotics industry is only emerging. Most #robots sold in China are made by joint venture companies the norm there. 5/ @hiskov: China wants to the leader in #industrialrobotics. Growth in US is 9-13% in this area while it's more than 40%+ in China. 6/ Today many #robotics companies are investing in China rather than USA because that's is where the big opportunity is. 7/ But US #universities and #innovation ecosystem still attractive to college grads. So #robotics companies house R&D centers in US. 8/ @hiskov: It is still our opportunity to lose. #robotics #industrialrobotics #manufacturing /end. Osaka University - 5 cohorts strong! A fifth cohort of ten students and faculty from Osaka University attended the 2-week Global Innovation Training program at UC San Diego to learn how to bring their ideas from the lab to the market. The Global Innovation Training Program is an opportunity for our international partners are introduced to commercialization skills including team formation, customer validation, building the business model, and go-to-market planning. Jonathan Masters (instructor) and Dennis Abremski (IGE Director) with Ayumi Kawasaki receiving her certificate for the program. During this cohort, the attendees were able to practice their presentation skills and highlight their ideas and technology through a poster session open to the UC San Diego Community. Serial entrepreneurs Jonathan Masters (Lead Instructor of Osaka Program) and Albert Liu (Lead Mentor of Osaka Program) selected 4 of the 10 projects presented and created 2 to 3 person teams to work on each project together. Within the duration of the program, everyone participated in team building exercises with the Gordon Center and experiential design exercises with DD Studio CEO, Charles Cunbburn. Human-centered Design is a process to understand customer needs, which is the initial step in the Lean Launchpad process of commercialization taught at IGE. The group also visited local startup companies, such as Whova and NanoCellect Biomedical, and hosted guest speakers such as NSF I-Corps graduate, Lorenzo Ferrari, and Ichiro “Ike” Toriyama, Sony R&D Director. At the end of the program, the teams presented what they had learned over the 2-week period to a panel of serial entrepreneurs and investors. Derek Footer, Jan Dehesh and Richard Kuntz selected Ayumi.co as the winning team, but they said all 4 teams have great ideas with a strong chance for success. The whole class visiting the Pepper House. Ayumi.co is a company aimed at creating drug candidates for pharmaceuticals using a novel gene-based method of developing new compounds from plants. Winning team members include Ayumi Kawasaki, Ryo Iwamoto, & Mario Nagase, who are all doctoral students in Science & Engineering. Other technological ideas explored in the program included: VisFlu, a company aimed to provide diagnosis of any infectious disease in the world with a gene-based kit that can detect viruses and drug resistance in 15 mins, Nanaota created a new lithium ion battery using nanomaterials to last longer and avoid the risk of fire, and MIRAI, a portable and inexpensive analyzer that utilizes infrared light to maintain quality control during drug development using. Gaurav Agrawal, a member of both the Gordon Engineering Leadership Center and the von Liebig Entrepreneurism Center, has become a co-founder and Vice President of Blue LINC, an incubator that allows students to bridge the gap between real world healthcare issues and students with the knowledge to solve them. Gaurav attributes his success with Blue LINC to his personal and leadership development from both the Gordon Center and von Liebig Center. “Participation in I-Corps made me a stronger and more confident public speaker. The Gordon Center program really provided wonderful insight into my own tendencies with respect to communication, leadership style, and more, whether it is an individual or group setting. It gave me an opportunity to reflect on myself and to learn from my fellow student leaders. I now find that I pay closer attention to the way I act, the words I use, and the body language of myself and those around me. I am confident that these soft skills will help me succeed as an entrepreneur as well.” said Gaurav. Blue LINC consists of a group of graduate students with backgrounds in medicine, business, engineering, and design who came together to establish a biomedical incubator. The incubator allows fairly new businesses to develop themselves and their teams professionally. 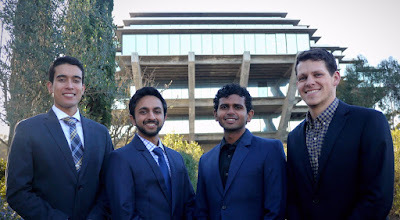 Gaurav co-found Blue LINC alongside Kevin Jubbal (President), Nick Forsh (Director of Internal Affairs), and Vish Ramesh (Director of External Affairs). In its first year, Blue LINC hopes to create opportunities, develop programs, and make connections for individuals, while also focusing on medical needs. Gaurav believes that this program can be a huge reward to the university in the long run. The incubator could open the door to more opportunities, while also creating a collaborative environment across different departments campus wide. Gaurav is looking forward to more student involvement to take on leadership roles in Blue LINC. He also hopes to expand the program by establishing an advisory board to support the current and future leadership of the program. Blue LINC cofounders Kevin Jubbal, Gaurav Agrawal, Vish Ramesh, and Nick Forsch. If you would like to learn more about the Gordon Scholar program or UC San Diego’s NSF I-Corps program please visit the Institute for the Global Entrepreneur. Both the Gordon Engineering Leadership Center and the von Liebig Entrepreneurism Center are part of the Institute for the Global Entrepreneur.